What is pseudoscience and how does one recognize it? Scientists and philosophers have long struggled to answer this difficult question. 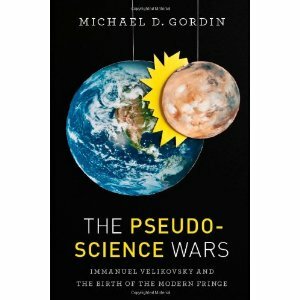 A book published last year, The Pseudoscience Wars: Immanuel Velikovsky and the Birth of the Modern Fringe by Michael Gordin, helps to further refine our understanding of what pseudoscience is by examining the rise and fall of a form of catastrophism promoted by Immanuel Velikovsky. Velikovsky, was a Russian psychiatrist and scholar who wrote the best-selling book Worlds in Collision in 1950. In that book he proposed to explain all the major events in human history as the result of catastrophes brought on by close encounters that the Earth had with Venus, Mars and other bodies of the solar system that in the past, in his estimation, were more chaotically moving around the solar system.